Use data storage federation to address these problems. The LogicalResources hold basic metadata such as modification date, length, etc. The PDRI component represents the physical data. 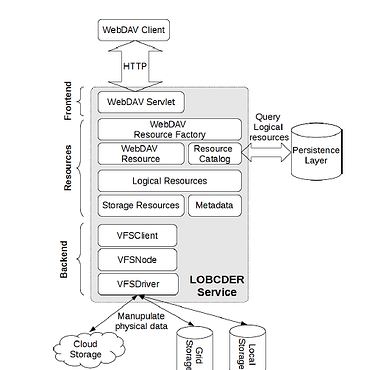 The backend layer provides the necessary abstraction to uniformly access physical storage resources. The VFSClient can perform file system operations on physical data. It provides Atomicity, Consistency, Isolation and Durability (ACID). These properties are necessary in a multiuser environment for maintaining a synchronized and consistent view of the shared file system. S. Koulouzis, D. Vasyunin, R.S. Cushing, A.S.Z. Belloum, Cloud Data Storage Federation for Scientific Applications, In Proceedings of the Euro-Par 2013: Parallel Processing Workshops, Lecture Notes in Computer Science, Aachen, Germany, Aug 2013.